Kieran was a great guide and driver. He was great with our 10 and 11 year old girls. He had us purchase timed entrance tickets ahead of time so we didn't have to wait in any lines. It was a very organized tour and he recommended a great pub for dinner after our tour. On time and quite entertaining. Very well informed of the area. Would use again. Kieran was an amazing guide. So funny, knowledgeable, & personable. We enjoyed his extensive knowledge of Ireland's history and how he helped us navigate around large crowds from tour buses. Our van was very comfortable and was the perfect way to travel around Ireland. It is said that travel broadens the mind...inspiring a new perspective of somewhere familiar, or a treasure hidden in a place currently unknown. That is exactly what Kieran accomplished during our Wicklow - Private Tour. Kieran customized the tour so that we could see and experience a varied bit of Wicklow. We went to Dublin Bay - Lough Tay - Glendalough - a Sheepdog Demonstration and enjoyed a fantastic lunch together. His knowledge and insight is incredible. How fortunate we were! Highly recommend!! Great guide and wonderful day !! We've often used Tours by Locals and I can honestly say Kieran has been the most enthusiastic and knowledgeable of any guide we've experienced. We spent a thoroughly delightful day exploring the history of Boyne Valley with him. And to top it off his sense of humor is truly a gift. We highly recommend him. Kieran is an excellent guide and most importantly an awesome driver. He picked us up at our hotel in a very comfortable van. We were a group of 5 including 2 teenage boys. He taylored our trip so that it was interesting for everyone. He is very knowledgeable about Ireland including history, politics and culture. Kieran is a very entertaining speaker and storyteller. Because of his knowledge and driving skills we were able to get a very comprehensive tour of Dublin in one day. Kieran fits A LOT into his day (in a very good way). He knows his history inside and out and explains it so it is interesting to everyone. He plans and allows for you to take as much time as you like to explore some of the sites he takes you too. The gardens at Powerscourt were amazing and we had ample time to explore. You'll truly enjoy your day with Kieran. I highly recommend! Spent part of our day in Dublin with Kieran, C. He was very knowledgeable and determined to make our time with him very special. We could not be happier and would recommend him highly. Wish we would have had more time to discover his "Ireland" with him. On an amazingly beautiful day in Ireland, Kieran was the best companion and guide. He was extremely knowledgeable, attentive to our needs, and a great person to spend a day in the Boyne valley with. We learned so much, and had a delicious lunch on the patio of a castle to boot! Our day with Kieran was wonderful. He emailed us in advance to customize the tour to meet our specific interests. He was prompt and an excellent driver. We look forward to returning and hope to enlist his expertise again. Kieran was great. He allowed us to move at our own pace. Loved the visit to Trinity College to see the Book of Kells. He was very knowledgeable and interesting to listen to. A great guide. Kieran was a delight and very knowledgeable about Dublin and the countryside. He customized the tour to our wishes, plus suggested sights we did not know about which made the tour even more interesting. Would use him again when in Dublin. Seeing the countryside in the Wicklow region and the Russborough House also a treat. The Tavern near the ruins built by the monks was superb. Order their bangers and mash and have Irish coffee. Kieran C was timely and informative. After learning a bit about our likes, he tailored the tour to show us sites of shared interest, including personal touches. He gave us time to explore independently ... something I greatly appreciated, while always being readily available for us. Even when we felt fatigued, his enthusiasm and knowledge helped us regain energy. Overall, the single BEST way we could have started our Ireland holiday. Kieran was friendly, enthusiastic, and helpful throughout the tour. We learned a lot about Ireland and all of the landmarks and villages that we passed. Would gladly attend a tour with him again! TOUR GUIDE RESPONSE: Thank you so much for your kind words and lovely review. I am delighted that you enjoyed your tour to the West of Ireland and the Cliffs of Moher. You were all very pleasant company. It was my pleasure. Thank you. Kieran. I don't even know where to begin to describe how exceptional this "ToursByLocals" was for our family! Kieran was kind, thoughtful, professional, interesting, and friendly from start to finish -- and he was with us for 10+ hours! He catered the tour itinerary to our specifics while still keeping the general scope of the outing intact. Because of his service and spirit, we not only saw but took in culturally more than we could have on our own or with a mega/bus tour -- he made our trip truly memorable. My family of 4 had such a wonderful time with Kieran during our 2 days in Dublin. He was spot on time, knowledgeable and very witty and entertaining. He quickly read the interests of our teenage boys and adapted our customised itinerary accordingly, to everyone's enjoyment. He also assisted with restaurant suggestions and reservations. We highly recommend Kieran to future Dublin visitors. Thank you for a friendly upbeat tour full of information and good cheer. We will be back and when we are you will be the first ti know. Knowledgable. Easy going. Choose fun and interesting stops. Great lunch. Stop. Safe driver. Highly recommend. Thank you. Kieran was a fabulous guide. He was extremely knowledgeable about Ireland and Irish history as well as the sites we visited. Kieran was very personable and entertaining and amenable to just about anything we wished to do. I have taken a number of toursbylocal tours and I think he is one of, if not, the best guide I have had. Would highly recommend him. Kieran was excellent as well as entertaining, quite funny and very knowledgeable.. He drove us from Dublin to the West side of Ireland and back. We got to see quite a bit considering our trip was in December and the daylight was short. We would highly recommend Kieran. TOUR GUIDE RESPONSE: Hello Beth, I am delighted that you enjoyed your day in the West of Ireland. We did pretty well considering the time of year for sure. It was my pleasure and I appreciate the kind words. Say hello to everyone for me. Kieran. Fabulous guide - informed, professional and very personable. Kieran made sure we were comfortable and we all had an amazing and fun day with him. We loved his vehicle and his personality. There were 4 of us and we all highly recommend him. We would all book him again with no hesitation. We visited the cliffs of Moher, St. John's Castle, an amazing pub with incredible pub food and took a scenic drive through so many countryside features stopping along the way. Thanks Kieran. Kieran is a great guide. He is very knowledgeable, friendly, super sense of humor. We had a wonderful tour....just what we wanted. We would highly recommend him to anyone visiting Dublin. We had a great day with Kieran. All 5 people in our party were very pleased with the day and the things we saw. We will be coming back for more. Thanks Kieran! Kieran was AWESOME!!! We all had a beautiful day in Ireland with him as our guide! Kieran was very knowledgeable and we learned so much about Ireland from him! We could not have had a better day, it was just perfect! We were able to take in more sights then we originally thought would be possible!!! Kieran was such a gentleman and took great care of us, he was even able to get us a reservation at one of the best local pub's! We would 100% recommend Kieran for any tour, you will not be disappointed!!! Kieran is a fine guide, very knowledgeable and communicative. No questions went unanswered and no requests were left unfilled. Kieran was absolutely wonderful! He was really able to show us some of the countryside that most people don't get a chance to see on tours. Kieran is super funny and knowledgeable about his homeland and kept the day well paced and interesting for everyone. I highly recommend taking a tour with him! Did a wonderful job! We saw so much. Great sense of humor! We had a wonderful day with Kieran! He was knowledgeable and delightful. We would highly recommend him. Kieran was a great tour guide, very friendly and knowledgeable. My party and I particularly enjoyed the stop at Powerscourt Gardens, simply awesome! We had a fantastic day with Kieran. We were a group of four, which included our 19 and 22 year old sons, and we thoroughly enjoyed Kieran's in-depth knowledge, humor and story-telling. While we had an overall plan for the day, we stayed at individual locations for as long as we liked, and Kieran was quite adept at modifying the schedule throughout the day. One of the best parts of the day was having lunch with Kieran, and talking about life in Ireland. You will not be disappointed. What a fun day! Kieran is a great person to spend time with. Super knowledgeable about Ireland's history and all the sites you will see. Also very willing to be flexible with the itinerary. Kieran is well versed in Ireland history and geography and can speak like a New Yorker without local accent. He planned a very comprehensive tour of Dublin for the 6 of us from US covering the city and nearby sites including Wicklow and Glendalough in 7 hours. We also enjoyed the fun filled ride in a spacious Mercedes with conversations about Ireland culture, history and perceptive global views of politics. He made the Dublin tour the highlight of our trip which included many cities in UK and Ireland. BEST day tour on our British Isles trip. Kieran knows Dublin and the Wicklow area and he treated us to an unforgettable adventure. Stopping for photos of the sheep on the countryside...no problem. More time at the Avoca weaving sheds,,,,not to mention the shop...take your time. Dublin and the Wicklow Moutain area is best seen through the eyes of a local guide in a small group. We hope to return to Ireland and will definitely check out Tours by Local first. Kieran is an awesome tour guide! He has a stellar sense of humor while imparting the most interesting tidbits of history! Don't think twice about booking a tour with him. He picked us up at our front door in Dublin for the Newgrange day trip tour. It was nonstop smiles throughout the whole day. Just do it! We booked a tour with Kieran to Northern Ireland. He was very knowledgeable and gave personal insight to his experience growing up during the time of rebellion. He was very personable and accommodating. We were with him for 13 hours-- and we chatted about different things almost the whole time we were in the van. Van was clean and comfortable! He was ready and waiting for us upon departure. He was responsive to questions prior to booking. I would 100% book another tour with Kieran!! We had two tours with Kieran during our vacation in Ireland. Both were fabulous! Kieran was an amazing guide, and had a vast and impressive knowledge of history. He even went out of his way to research sites having to do with our ancestry - taking us to places off the regular route. We definatey appreciated all he did for us. We learned so much, and definitely recommend him. We had six in our group, from ages 21 - 80 years old, and everyone loved him. Thank you Kieran from the mcnamara clan! Tour guide was prompt and very professional had a nice personality and was very knowledgeable about the history of the areas we toured. Polite and courteous. Explained in great detailed the history of the area and was a pleasure to talk to. Would highly recommend him! This tour was a great highlight of our trip. We toured Dublin and the nearby countryside over two days with Kieran. He clearly demonstrated his knowledge of Irish history (obtained through a Master's Degree in Medieval History) in a conversational, often humorous manner. It was a pleasure to spend the time with Kieran during which he made every moment enjoyable. He clearly loves his work and made every effort to make our tours interesting, fun and memorable. We really enjoyed our day in western Ireland. Kieran was informative and thoughtful. We would book again with Tours by Locals. Another great day touring with Kieran!! I had actually toured with him previously and once again he made a great day for us. We were able to see a great slice of western Ireland even though we had some traffic and we were coming all the way from Malahide. Kieran never failed to not only take us to the more popular attractions but also to the hidden gems that I would never find alone. I will be back and certainly book more touring with Kieran!! Kieran is an exceptional guide. He is knowledgeable, interesting and has a great sense of humor. We have fallen in love with Ireland and Kieran is a big part of why we feel that way. Kieran made Dublin come alive for us in a day's tour. He took into account our physical limitations, yet provide us with a quality experience. He went over and beyond the call of duty to make certain we had a great experience. He's the best Guide we've ever had. We had a wonderful day touring Dublin with Kieran. He has a wealth of historical information and livened the day with his quick wit. We were staying outside of Dublin and when I asked if he could meet us at the train station he volunteered to come and pick us up. I would highly recommend Kieran for a most enjoyable day. We had a wonderful time seeing the sights of Wicklow with Kieran. Spending the day seeing part of a beautiful country, with someone so knowledgable and nice, was the highlight of our trip. Would definitely take another tour in the future with Kieran. If you are lucky enough to retain Kieran's services then you are lucky indeed! The perfect start to our holiday in Ireland. Funny and attentive and knowledgeable. Wish we could have had him for our entire trip. He worked with us to create a custom itinerary that perfectly suited our wants and needs based on the remainder of our trip. Book him today!! One of the best tours I have ever had. The knowledge and history at his hand was wonderful. Also, a very caring and personable individual. Kieran was an excellent guide. He tailored the tour to meet our limited mobility needs, plus special requests. We like to hear the history and special stories or facts about the places we visit and he was very knowledgable. We really enjoyed the tour. This was Day 2, and Kieran again planned the schedule perfectly. He has an incredible knowledge base which he imparts in a very human way that reflects his passion for his country and what he does. We went to Newgrange, Monasterboice, Slane Abbey and the Trim Castle - awesome! We cannot leave out the great pubs he brought us to for incredible fish and chips. Another outstanding day! We would HIGHLY recommend him and definitely use him again on a return visit. Kieran delivers! We spent two very full days with him. He gave us a sense and awe of history in places we probably would not have had the opportunity to have seen. He timed things well so that we could see as much as possible and we did. On the first day, we went through Dublin and up the coast to Powerscourt estate, then on to Trinity College and the Book of Kells, and finally St. Patrick's Cathedral. What a day! A splendid guide—knowledgeable, considerate, efficient, enjoyable. Our Wicklow tour with Kieran was great. It was our second day to tour with Kieran, and he made the day really special. Even though we had a bit of rain during the day, our tour did not suffer. The countryside was so lovely, and Glendalough was inspiring. We are now great fams of tours by locals. Our tour with Kiernan to Newgrange and the Boyne Valley was my favorite day in our week in Ireland. He imparted so much history of Ireland to us. I never realized that Ireland was such an ancient place. Newgrange gave me chills--to see such master construction in building 5000 years ago. My wife and I visited Ireland with another couple. We spent our first day in Dublin doing a tour with Kieran to all of the major sites. At dinner that evening, the husband of the other couple asked what we liked best in Dublin. We all agreed that Kieran was the best part of our day touring Dublin. He has a great personality and was just a delight to be with. Excellent tour and even better tour guide! I highly recommend Kieran as a tour guide. He explained everything we visited in great detail, a lot of very interesting! He answered all my questions, has a great sense of humor and is a polite gent as well! I loved this private tour to Wicklow, the gardens at Powercourt were amazing (even in the rain!) the beautiful drive through the rolling green hills of Wicklow, beautiful vistas. Really enjoyed the Avoca Weavers Mill. Thank you Kieran! Kieran gave a comprehensive and informative tour where we visited various locations in the Boyne Valley - Newgrange, Monasterboice, Hill of Slane, Trim Castle & Hill of Tara. He is an engaging, intelligent and amusing host & I cannot recommend him highly enough. I don't believe you will find a better tour guide operating in the Dublin area. If you want to get out of Dublin into the Irish countryside & learn about a history that goes back 5,000 years this is the tour to book. We can recommend Kieran wholeheartedly. His knowledge of the area was a true pleasure to listen to. We certainly had a fabulous tour! This tour was the highlight of our trip after watching the TV show Ballykissangel for many years. The town of Avoca was so charming. Kieran was just exceptional and met all our needs. He has great knowledge and is a pleasure to listen to. Please take the time to see this beautiful area if able. You will not be disappointed. We had an excellent tour with Kieran. 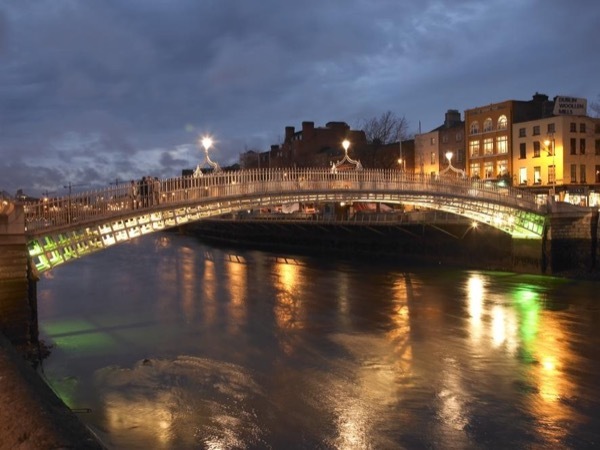 He is very knowledgeable and passionate about the history and culture of Dublin and Ireland. The tour was well planned and had a good variety of things to do and see. We highly recommend Kieran for a wonderful day touring Dublin! Kieran's tour was the highlight of our trip. Not only was he very knowledgable, he was also delightful to be around. The sights that we visited are amazing. Newgrange is spectacular, and if you're looking to visit a medieval castle, look no further than Trim. I couldn't recommend this tour more!! Fabulous guide despite the limited time for the tour. Keiran' s briefing on the cultural, political and historical aspects of the city were most welcome, particularly the focus on the Vikings. He managed to avoid the crowds thus making our visit to St. Patrick Cathedral very easy. Kieran has a great sense of humor and was very attentive to the needs of one of the couples who had a meeting in the city following the tour. He dropped them off at the site. A plus: a very comfortable car for 4 persons. We had a great time with Kieran on each of the three full day tours we took with him. He is a fount of knowledge and not at all scripted. He was always on time and flexible as we went along. We could not have been more pleased with the tours. Excellent tour guide and historian - would highly recommend. We had an absolutely perfect day with Kieran! He got us out early and ahead of the crowds,which made a world of difference at Newgrange. Kieran is very personable and knowledgeable, making our day even better than I expected. This is my 5th trip to Ireland and Kieran brought us to locations that still took my breath away. I am hoping to see him again on my next trip! My sister and I had Kieran for three days on three separate tours. He was an excellent guide, by far one of the best we've ever had. He was always on time, extremely knowledgeable, courteous, and with a great personality overall. He also went out of his way to provide assistance to help us with a laptop we had misplaced at the start of our journey. We enjoyed our time with Kieran immensely and would highly recommend his services. My boyfriend and I had an amazing time with Kieran on our Newgrange and Boyne Valley tour. We really enjoyed the scope of history and Keiran's extensive knowledge. He showed us sites we would not have found on our own and provided great context to the sites visited. I would highly recommend this tour to all visitors to Ireland. Kieran was terrific! He met us(family of 4-ages 30's and 60's) at the pier and off we went for a day in Dublin. Not a minute wasted on his all day Dublin City tour - even when traffic was stalled he went to an alternative sight. He is very knowledgeable about Dublin and Irish culture but most of all he is witty and humorous! There was never a dull moment on this tour. We ended the day in a local pub with Kieran helping us order local food/drink. WOW... what an amazing meal and great stories we shared! The tour provided by Kieran was informative, fun, interesting and worth every penny. Our trip to Newgrange and the Boyne Valley was the most memorable part of our trip to Ireland, thanks to Kieran's deep knowledge of the history of the area and his style of presentation. We would encourage others to take advantage of this type of tour to make their trip as enjoyable as ours. Kieran provided a fantastic tour! He was a pleasure to spend the day with. Our tour with him was a highlight of our trip to Ireland. Kieran is smart, funny, and patient. He answered all questions with a candor that we appreciated and enjoyed. With him, we felt like this day was spent well in historically significant places with someone who understood Irish culture, current and historical events and could convey them well. It really was a great day. Thanks Kieran!!! Kieran is very knowledgeable about Ireland and it's history. Very attentive to our interests, and made sure the tour was aligned with what we wanted to do. High energy. Willing to answer any questions. We enjoyed every minute. Kieran was the best guide ever. He greeted us in a very friendly, professional manner and was well dressed. His knowledge and presentation was excellent. We made some slight changes in the itinerary and he put it all together beautifully. I and the others in our group highly recommend him. Great, great guide. Kieran is knowledgable, funny and patient. Only suggestion is to use microphone when in large van so folks in back can hear. Imagine being picked up at your hotel and escorted to a lovely Mercedes Benz! That is how my day started with Kieran and while I thought it couldn't get better, it did! Kieran was a fantastic host and historian as he drove me through the City of Dublin and out to the Oceanside. I discovered there were parts of Dublin...including 40 foot drop that I would have never have known about if I didn't take this lovely private tour with Kieran. I will take it again.. Though we walked in pouring rain, that in no way dampened kieran's enthusiasm and his love of Irish culture and history. He was great. When I return, I will contact him again. Knowledge and passion and love of helping others appreciate the beauty and history of Ireland were all shared freely by Kieran. He did an outstanding job. And by the way, the weather was awful, and that didn't dampen my enthusiasm one bit.